Before I call, do you know if they are accepting reservations for September yet? I have booked a colosseum/forum tour with a tour company and I will be paying the ticket fee when we arrive. Is this ticket good for the day if I would like to re-enter and do this tour? Charlie – I don’t know, but I highly doubt it. I’d try them a bit closer to when you come! Sue – You won’t be able to use the same ticket to get into the Colosseum twice. 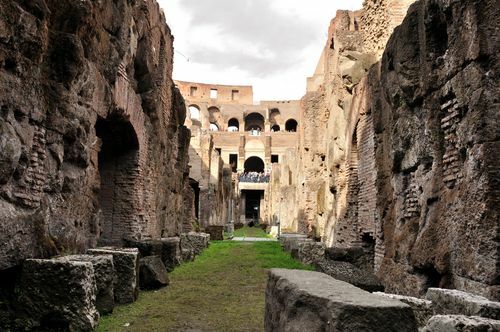 If you’re lucky, maybe your tour finishes inside the Colosseum (I’d ask) AND you can book a hypogeum tour that takes place shortly thereafter. hi – thanks for your updated information. Just got off the phone- made a successful reservation for March 27- the process was very easy, the operators were very helpful! – we are looking forward to our first visit to rome. FYI: Just phoned this morning – they would not take a reservation for end of May yet (even though their Website says reservations available through June). They told me to call back on Mar 21. My husband tried calling yesterday to reserve tickets on 17 April. We were told they weren’t available yet and to call back next week. Michele, Stuart and Christine, thanks so much for keeping us updated! Please let us know how the tours go when you get there. It’s a good introduction to how Italy works! Just be patient. I don’t think enough people are booking this yet for you to not be able to make a reservation just a few days in advance. Good luck! I just ordered my tour for next Friday, with very little waiting time. Has anyone been successful in making reservations for May, 2011 yet? Just be patient. As Nathalie’s comment shows, these tours aren’t filling up so fast you can’t book it only a week in advance. Wait a bit longer, then try again. I wouldn’t try to book May until at least mid-April. And please, please don’t waste money on international calls! There’s absolutely no reason to. Download Skype, and you can call international phones for a very low rate. And Nathalie, I’m glad it went smoothly for you. Let us know how the tour goes! Can somebody tell me what’s the price – here it’s written 9€, but on the official site it says 8€. Do I have to pay with credit card or I can only book a ticket and then pay on site? And finally – is it possible to buy a ticket when in Rome? Anyone have any ideas about reservation process during Settimana della cCultura? If the Colosseum is free that week, do I pay only for the tour ticket to see the hypogeum? At last! Our wonderful hotel concierge at Hotel Sonya was able to secure our tickets for 17 April. It only took him about 3-4 tries. Thank goodness for his persistence! I heard on another site that they were finally taking reservation for April & May. I called very early Saturday morning and made reservations for May 26th. They were only offering a 9:40am, 1:00pm, and 4:20pm on that day in English. I couldn’t get the operator to tell me if the 3:00 pm (the time we really wanted) was full or just not offered. We went ahead and reserved the 4:20pm. They charged us 12E for the Colosseum fee and 9.5E for the tour. They charged our credit card and gave us a confirmation number. We are only in Rome for one day and I’m hoping everything will work out as planned. I called yesterday and booked 2 tickets for the end of April. Reading all the other comments, I think I should be glad that I succeeded so quickly! I hope it will be worthwhile, looking forward to our 4 day stay in Rome. I just reserved tickets for the Colosseum underground tour and two intersting things occurred: 1) the operator told me that I could purchase those tickets at http://www.pierreci.it. I had tried that prior to calling, but didn’t see anywhere to do that. 2) I had to pay for the tickets at the time I booked. This is different from what had been previously reported. Can’t wait – soo excited to see the underground and third level.